In early 1978, a song entitled “Dust in the Wind” by a rock band known as Kansas shot up the Billboard charts. 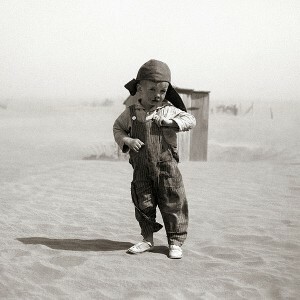 When Kerry Livgren penned those now famous lyrics, he probably never imagined that Dust Bowl conditions would return to his home state just a few short decades later. Sadly, that is precisely what is happening. When American explorers first traveled through north Texas, Oklahoma and Kansas, they referred to it as “the Great American Desert” and they doubted that anyone would ever be able to farm it. But as history has shown, when that area gets plenty of precipitation the farming is actually quite good. Unfortunately, the region is now in the midst of a devastating multi-year drought which never seems to end. Right now, 56 percent of Texas, 64 percent of Oklahoma and 80 percentof Kansas are experiencing “severe drought”, and the long range forecast for this upcoming summer is not good. In fact, some areas in the region are already drier than they were during the worst times of the 1930s. And the relentless high winds that are plaguing that area of the country are kicking up some hellacious dust storms. For example, some parts of Kansas experienced a two day dust storm last month. And Lubbock, Texas was hit be a three day dust storm last month. We are witnessing things that we have not seen since the depths of the Dust Bowl days, and unless the region starts getting a serious amount of rain, things are going to get a whole lot worse before they get any better.